Rwanda president Paul Kagame told journalists on Monday that Rwanda-Uganda standoff is a discomfort, he however says the conflict is hyped by the media. He said the differences between the two brotherly countries will be soon solved soon. Kagame made the remarks during press conference where he answered questions fielded by members of the press representing local and international media houses who are in the country to cover 25th commemoration of the genocide. Kagame responded to various issues related to the genocide, peace and security, regional integration and Rwanda’s transformation. “Yes there is discomfort and issues we have to resolve, but I would rather we focus on resolving problems in the East African Community somewhere else outside the media”. “I think [the Rwanda-Uganda conflict] is a problem I believe will also come to pass. There will always be problems between countries, with different magnitudes. I would rather we continue finding ways of addressing problems outside of the media.” Kagame said. Rwanda’s relations with Uganda deteriorated recently with Kigali accusing Kampala of “three major issues”: support to individuals and groups focused on fighting the Rwandan government; arresting, torturing and deporting Rwandans as well as economic sabotage. Since February 28, when the crisis exploded, Rwanda has maintained a fierce media campaign. 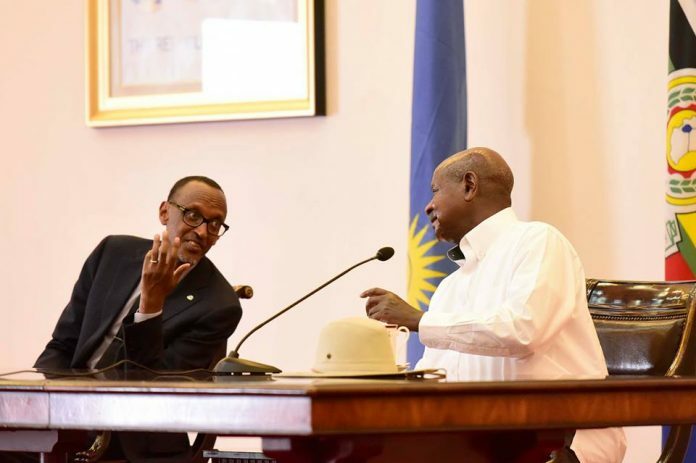 At some point, President Kagame revealed details of confidential discussions he had with President Museveni. Let us show African brotherliness by ending this Uganda-Rwanda standoff. We are both winners.